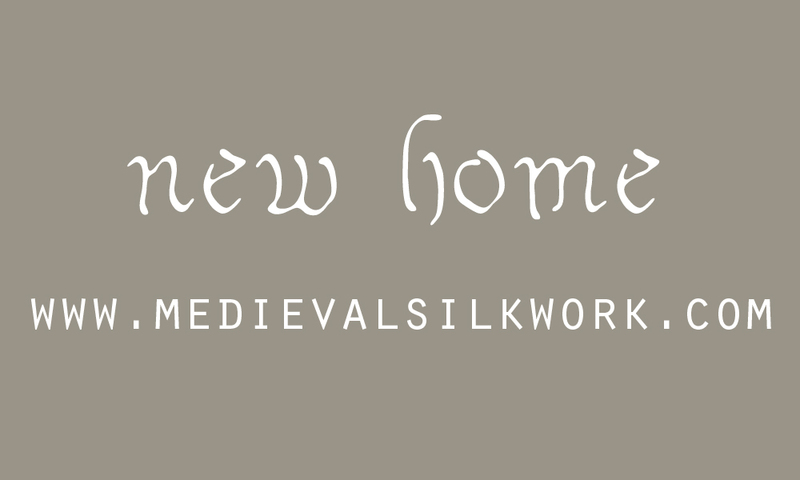 As of today Medieval Silkwork has got a new home! So go to your link-list and update the link. No worries though, the old blogspot web address will still work and automatically forward you to the right place. This makes me feel very official. Also, this blog now falls under a Creative Commons license as you can see at the bottom of this page. C) That you give proper credit to me. That means I'd like you to mention my name and a link to this website, which, as of today, is www.medievalsilkwork.com (yay!). I feel even more official now. I think I need a cup of tea (or two)! Through the viewfinder (TtV) will be a new post series on this blog in which I want to share with you a work of art, be it a painting, sculpture, manuscript or drawing from my collection of museum visit images. The photography geeks among you will already know this, but for everyone else: TtV photography is a photographic technique in which a photograph is shot with one camera through the viewfinder of a second camera. There is a parallel here to studying history through visual sources: when we use art as a source, we're looking through the eyes of the photographer, who in turn looks through the eyes of the painter or sculptor. Why yes, I did some deep thinking on this rainy Friday evening, you can tell! Hercules and Omphale (detail), c. 1587, Francesco Bassano, Kunsthistorisches Museum, Vienna. The first painting in this series is one I had the pleasure to see in person last April, when I was in Vienna for a conference. Hercules and Omphale by the Italian painter Francesco Bassano is not a very well known piece (finding some decent information on or even a decent picture of this painting online is not an easy feat) even though this theme from Greek and Roman mythology has been painted by various other painters of his time. Even though this tale has been told in a number of variations, but basically it goes something like this: the great hero Hercules, son of Zeus, accidentally kills his friend Iphitus. As penalty for a murder, one or other oracle (the sources disagree on which one) sends him off to serve Omphale, queen of Lydia, during the course of one year. As her slave, Hercules is forced to do women's work and even wear women's clothing together with the queen's maidens. After some time, Omphale ffalls in love with Hercules for his strength and physical beauty, and takes him as her husband. And they procreated and lived happily ever after. Or some such. Apparently when I took these photographs I carefully censured both Hercules and Omphale out. 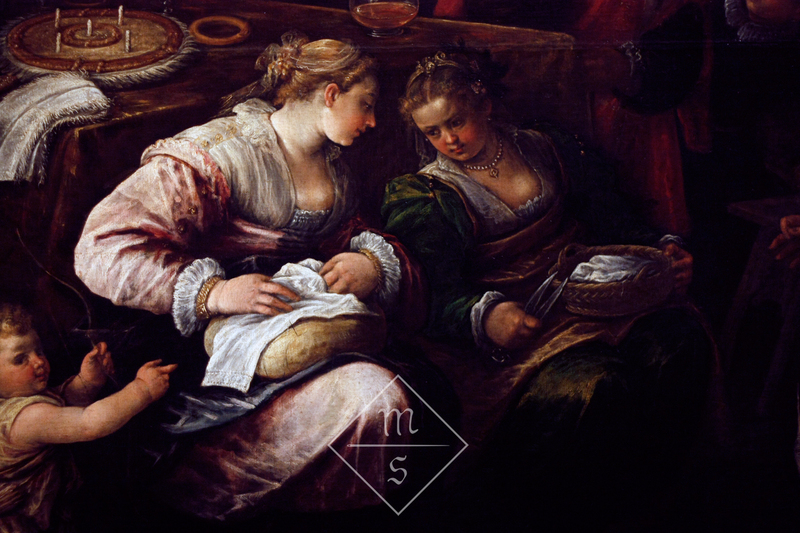 My attention was drawn to two maids, who are sitting quite in the center of the panel, doing their sewing work. 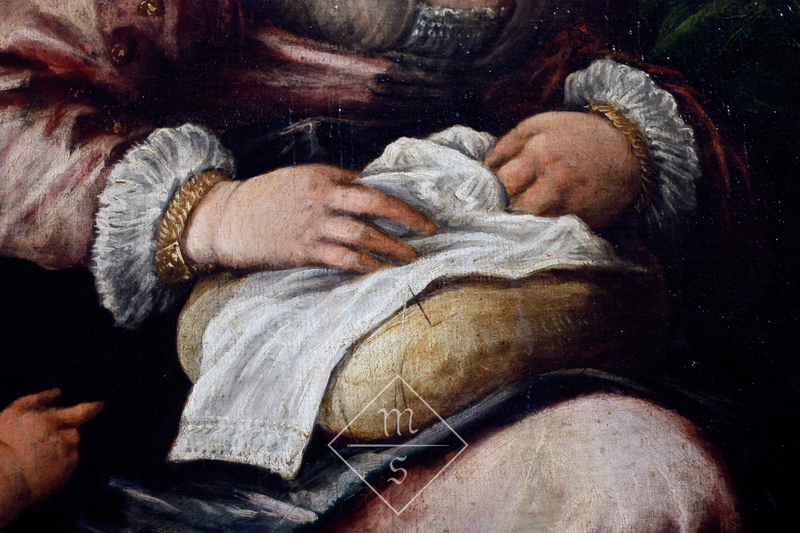 One of them has a pale yellow sewing cushion on her knees with a lace edged* linen garment on top (that I cannot seem to identify, suggestions and wild guesses are welcome). The other holds a sewing basket and a pair of shears. Meanwhile they seam to have a little private conversation. 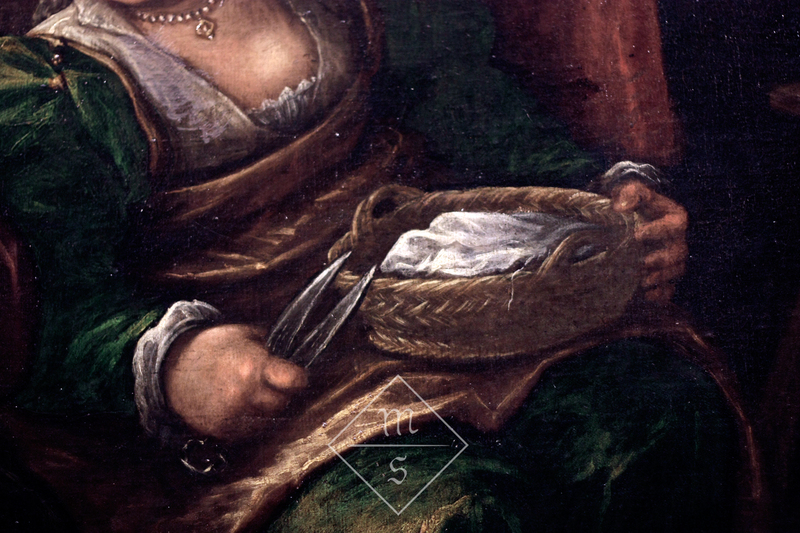 To me, this little scene brings to life the 16th century household inventories I work with everyday, where so often these two objects - a sewing cushion and a sewing basket - are mentioned together. *The lace edge could also be drawn thread work. For those who follow the Medieval Silkwork Facebook Page it's not brand new news anymore, but this blog now has a brand new banner and logo! They are the first step in the master plan I have devised for the future of Medieval Silkwork. As you have probably noticed, I haven't been updating this blog nearly as often as I would have liked, over the past, say, two or three years. This is largely due to my work as a PhD researcher, which doesn't leave me enough time to make a whole lot of embroidery and other things and talk to you about it. During the following weeks you'll probably notice a few other changes to the lay-out and hopefully also one or two posts before the end of the year! And lastly, but of major importance, I want to thank ALL of you for being the best and most loyal readers any blogger could ever wish for! Thank you for coming back here to look at old posts, for still using all the content of this blog to make your own Birgitta caps, frilled veils and embroidery projects! Thank you for being patient with me.